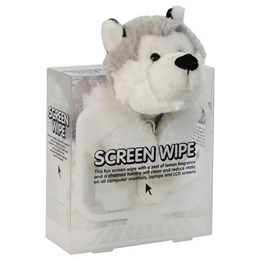 This cute little Husky Screen Wipe is a great way to add some fun to your workplace or home. Scented with a zest of lemon and a chamois tummy, this screen wipe will clean all computer monitors, laptops, phones and LCD screens. The Husky Screen Wipe will leave your precious screens sparkly clean and dust free by reducing static, so that dust particles will be repelled, making your viewing better and brighter. Fun and functional all at the same time, making it an ideal novelty gift for everyone. Do not use with other cleaning agents. This screen wipe cannot be heated. Below are reviews of Aroma Home Husky Screen Wipe by bodykind customers. If you have tried this product we'd love to hear what you think so please leave a review.